Chris was born October 13, 1985 in Albany, MN to Ricky and Debra Posa. Chris graduated from Olathe East High School with honors in 2004. 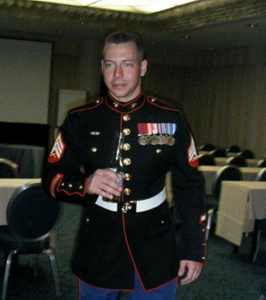 He then proceeded on to his military career with the United States Marine Corps until April 2015. Sergeant Posa’s expertise was in Satellite Communications during his career in the Marine Corps. When off duty, Chris enjoyed fishing, golfing, bowling, and spending time with family and friends. He was proceeded in death by his beloved brother Craig Posa, cousins Becky Sauerer and Dean Gill, grandparents Eldred Gill, Edward Posa, and Elaine Bixler. Chris is survived by his parents Ricky and Debra Posa of Gardner, KS. Brothers Corey, Colin, Caleb, and Caden Posa. Beloved soulmate Caitlin Walker and son Brysen. Nieces Rylee Nelson, Madison and Jennifer Posa. Nephews Caine Posa, Jordan Posa, Kyson and Greyson Posa. And many aunts, uncles, and cousins. To leave a special message for his family please use the "share memories" tab above. Add your memories to the guest book of Chris Posa. He was an amazing uncle to me even though he was gone most of the time I never forgot him and how much he loved me. He may not physically be here but I know he is still watching over me and loves me just as much as he did when he was here. And I miss him SOOO MUCH!!???? I'm so sorry to be learning of Chris's passing. I met him online via MySpace almost 8 years ago. We used to talk while he was stationed in Okinawa.... I worked the graveyard shift and he'd help me stay awake with funny and deep conversation. I have a Marine Corps blanket that he sent to me that now means even more. He was a beautiful person inside and out. He will be truly missed. Praying for you all. Chris was a very dear friend and neighbor of mine growing up. We haven't been in touch over the last 5 years or so but I will always remember all of the fun memories from growing up together. He always made me laugh and I'll always remember his silly sense of humor. God has really taken one of the best people from us, but I hope he is up there with Craig fishing and drinking a beer. To his family, I know he loved you all and would want you to get through this and remember his great smile forever. I'm so sorry for your loss and I'm so heartbroken I can't be there for the funeral. I don't know if anyone but Corey would remember me, but I dated him (Corey) WAY back in junior high and high school. Chris was nice enough to put Colin's snake on my head, forever terrifying me of snakes. I'm friends with Chris, Corey and Colin on Facebook and I've been able to see Chris' military career updates. I'm so saddened that he is no longer here. As a parent I can't imagine losing a child, much less two. Rick and Debbie and the rest of the family, my heart hurts for you. You were, and I'm sure still are, kind loving people. I'm sure Craig welcomed Chris with open arms. Thank you for raising a great man that fought for my freedom. Chris,you will be missed, but never forgotten.Love always auntie Lois. I am very sorry to hear about this. I wish I could do something more than just saying I'm sorry. He was truly a very special person. I will always remember him as a little kid when he would say "I'm mad at you" that always made me laugh. Even though we hardly saw one another I will still miss him very much your loving brother Dale. From MSGT Willis USMC Retired.